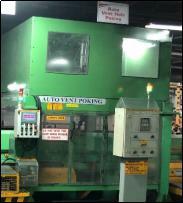 To enhance the productivity of High Pressure Molding Line (HPML) of Foundry PU in multifold by debottlenecking the critical stages and optimizing line balancing through development of LCA for mold poking and introducing material handling system for cylinder head core assemblies thus making line future ready. 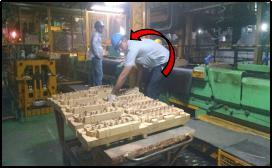 Foundry produces Cylinder Heads and Cylinder Blocks castings. 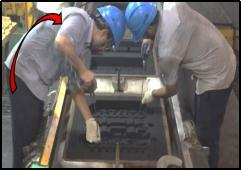 Typical processes involved are: Core Making – Mold making – Melting Pouring – Fettling. Our concern is on Mold Making which is done on High Pressure Molding Line (HPML). On High Pressure Molding Line, Vent hole poking operation and Cylinder Head core assembly placement are bottleneck stages due to high work content and are categorized as Red & Yellow stages respectively as per Ergonomic-SSES analysis. At daily rate of 60 Molds/Hrs. on an average 8000 nos. of vent holes are to be poked manually by operators in highly compacted sand mold which challenges their endurance & skill consistency. As per ergonomic-SSES analysis this stage is classified as ‘Red’ stage. As an ICA, we have compromised by rotating operators amongst work stations. Manual Poking also raises concern of cross poking, mold breakage which affects product quality & also limits production capacity. 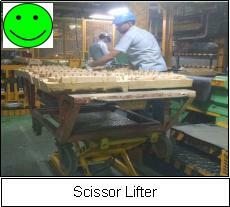 Similarly, at this stage operator has to bend and lift the core weighing 16Kg. for 120 times/hr. 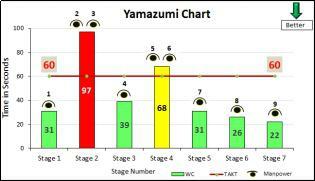 This stage also challenges the endurance of operators & hence classified as ‘Yellow’ stage as per Ergonomic SSES analysis. To overcome these issues M&M Foundry started looking for Innovative & Sustainable solution which not only improve quality of life of people but enhance Productivity, Quality thereby improving business performance. 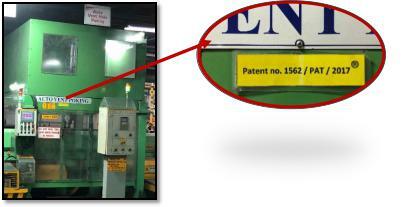 Manual Vent Poking operation was the most challenging task for productivity improvement. 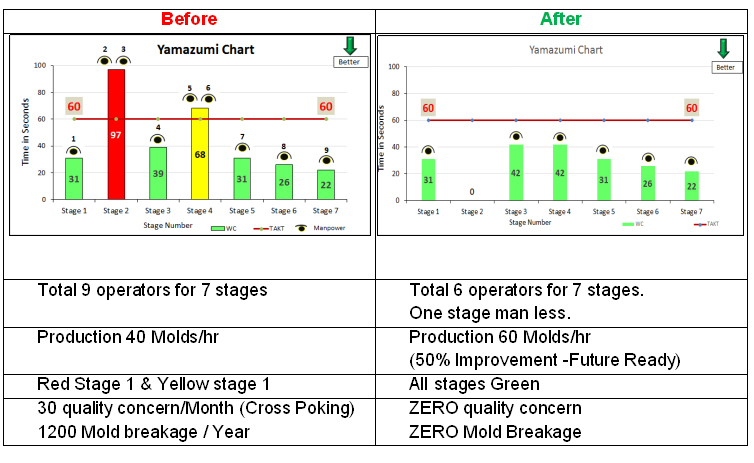 As it was having the highest work content stages among all other stages thus limiting the production to 40molds/hr. and was most fatigues stage. We followed structured approach of equipment development. After freezing the Technical parameters we have taken the Statement of requirement as Customer (User) input requirement, such as tool changing and tool homing system, Cycle time monitoring as well as various safety interlocks to safe guard main HPML as well as new Vent poking equipment from any malfunction leading to accident. We have made the system robust by incorporating 20+ interlocks. After developing the concept we have established strategic collaboration with the potential equipment developer who can work with M&M hand-in-hand for this project. 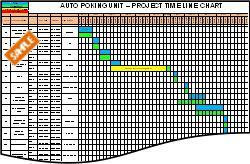 Project time planner followed for timely completion of project. 1.Limited availability of space for equipment Compact structural design with maximize axis travel. 2.Existing tool life of 4 hrs (won’t work in new equipment) Special geometry tool from Tungsten Carbide. 3.Establishing Tool Homing position which is in air Special Homing gage development. 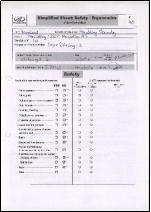 4.Heavy foundation impossible Chemical anchoring by using HILTI technology. 130% higher bonding strength then cement foundation. Team has successfully implemented the project in record time & successfully achieved all the deliverables. Affordable technology of X-Y Co-ordinate servo drives (X-Y-C) with Pneumatic high speed feeding (Z) system introduced for Vent Poking operation 1st time in Foundry Industry across globe as against OEM offered technology of hydraulic system. HPML OEM M/s. DISA (I) Ltd. & M/s. KW (I) Ltd. Visited and appreciated the design concept and implementation. Risk Mitigation : Like any other project there was risk of lower operational performance which may lead to tapering down the productivity. To mitigate this we have designed the entire equipment into ultra-compact design & hence were able to create additional station for Manual Poking as part of contingency plan. Training of operational and maintenance operators & officers was organized for New Technology machine which includes Parameters inputs, Program selection, SOP for Tool changing, and Tool homing, Pokayoke functioning, HMI interpretation, Preventive Maintenance of L M Guide ways & other critical mechanical as well as electronic systems. 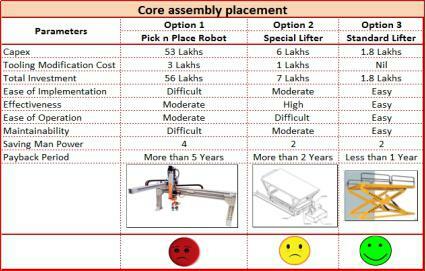 After analyzing the various parameters, most frugal, Easy to implement, Easy to Operate & Maintain solution of Standard scissor lifter (Option 3) was selected and implemented. With this Bending posture of operator is completely eliminated. We could get 10 seconds work content reduction at this stage which was utilized to rebalance the line for effectively optimizing one person per shift. 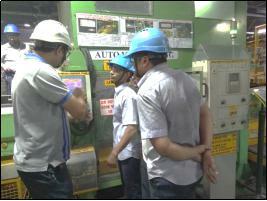 Newly developed technology seen by OEMs of HPML. We have offered them to share our technical details.